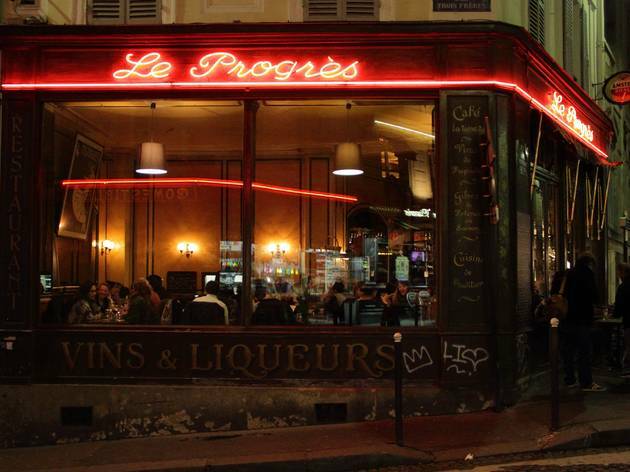 Finding an authentic old school bar in Montmartre is a real challenge, especially on the well-beaten tourist trail from Pigalle to La Place du Tertre. 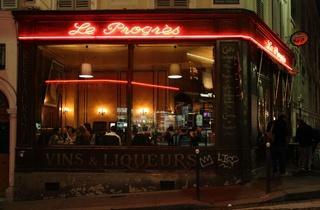 Le Progrès is an old-fashioned brasserie that has managed to conserve its charm, and is popular with hip locals and a few lucky tourists, happy to have unearthed a typical Parisian bar. We love its huge, wooden bay windows, through which you can look down into the small, animated square below. The food is reasonably priced and the atmosphere convivial, especially during after-work drinks. The service can be brusque and the food isn't worth the scrum to get a table, so avoid dinner times (12pm-6pm). In winter, the heated seating area is always rammed. Oh, I use to live 20 metres away form this place. The bar itself is very beautiful, old style and massive window. It's a very pleasant place to boire l' apero.